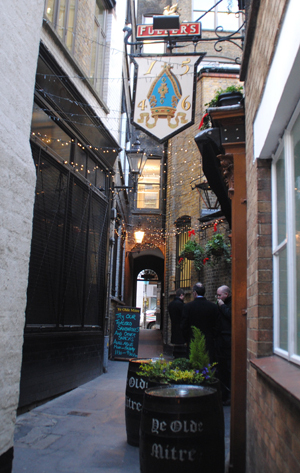 This small pub, found down a laneway – Ely Court – off Ely Place in Holborn, is considered by many one of London’s hardest to find. The name – which describes a bishop’s headwear – comes from the fact that the building was built by Bishop Goodrich of Ely, who lived in nearby Ely House, for his retainers. The original premises dated from 1546 but the current building on the site reportedly dates from about 1773 (about the date on which the bishop’s residence nearby was demolished). Interestingly, the pub was actually part of Cambridge – the city of Ely, and the Bishopric, being based there – which meant that the licensees once had to go to Cambridge for renewal. In 1576, part of the property, along with a substantial part of the bishop’s estate, was leased to Sir Christopher Hatton, favorite of Queen Elizabeth I (and the man after whom nearby Hatton Garden is named – more on that another time), on order of the Queen herself. Indeed the bar still houses the remains of a cherry tree behind glass. The tree is said to have marked the border between Sir Christopher’s land and the Bishop’s land. Sir Christopher, incidentally, is said to have danced around it during a May Day celebration the Queen though this tale may simply by apocryphal. Both Charles Dickens and Dr Johnson are said to have been customers here. The pub, which features dark panelling on the walls, still evokes a sense of the past with its olde world furnishings and fittings (and absence of more modern fittings like blaring TVs). Great place to pass a few hours in on a chilly day! For more on the pub, see http://yeoldemitreholburn.co.uk.